It was almost unbelievable that 95 MPs had insufficient brains to realise that their proposal for a national veto on EU laws was a non-starter. Even the egregious Kirkup had wit enough to realise that any such provision "would either fail or require an absolutely fundamental change in the nature of the EU as to call its very existence into question". This, of course, is barking cat territory, hence Mr Hague pointing out, perfectly reasonably, that it was "unrealistic". There is absolutely no chance, not the slightest, remotest chance that the "colleagues" will allow this to happen. Thus, when one is in a hole, it is customary to stop digging. 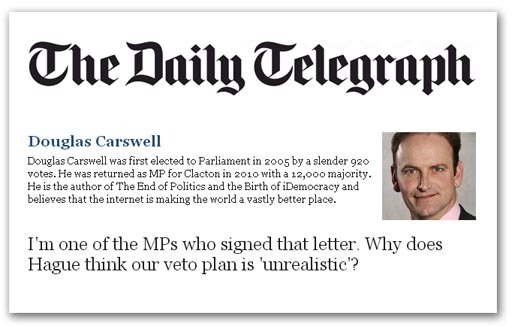 But such a simple stratagem is evidently beyond Mr Carswell. "Why does Hague think our veto plan is 'unrealistic'? ", he asks, having admitted that he was one of the 95 "brainless". That he now has to ask why his hairbrained scheme is "unrealistic" beggars belief. But Carswell compounds his idiocy by asking, "Why is allowing those we elect to have the final say over how we are governed not realistic? If allowing Parliament to curb the worst excesses of the Euro machine is not an option, what is?" Needless to say, there is nothing at all wrong with allowing those we elect to have some say in how we are governed (although Carswell neglects to say the MEPs are elected). But this isn't the point, is it? The point is that Mr Carswell and his colleagues are asking Mr Cameron to go to Brussels to secure treaty changes that will allow for national parliaments to be given a veto on EU law. And that is unrealistic. If Mr Carswell and his colleagues really want to have the "final say over how we are governed", then the only way he is going to get a sniff of it is if they go for Article 50. Prattling on about "vetoes" is dead-end street. It gets us nowhere. It is not adult politics.